The trial boat “Heather” hits rough water at Barnes Bridge. 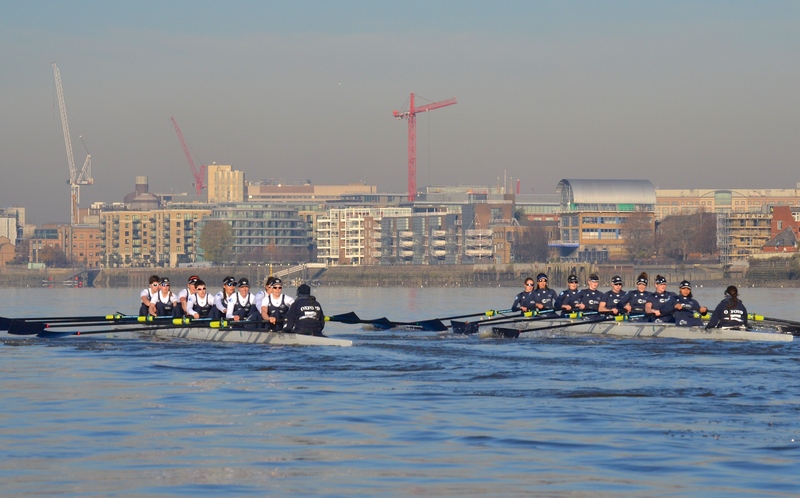 Yesterday, HTBS reported on the 2016 Trial Eights Race by the Oxford men, when the last 18 members of the squad each attempted to impress their coach enough to get a seat in the Blue Boat in the race against Cambridge on 2 April 2017. 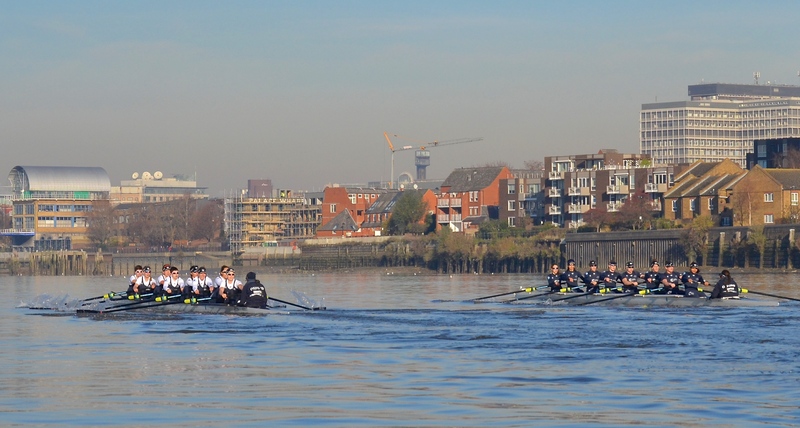 Today’s report is on the Oxford Women’s trial, held on the same day as the men’s, 30 November. Unfortunately, transport problems caused chief correspondent, Chris Dodd, to miss the race, while I, boy reporter Tim Koch, proved unable to take photographs and make notes at the same time. I have therefore stolen the race report published on the official Boat Race website, and this appears below, interspersed with my pictures and captions. For those unfamiliar with the course, follow this link for a map. 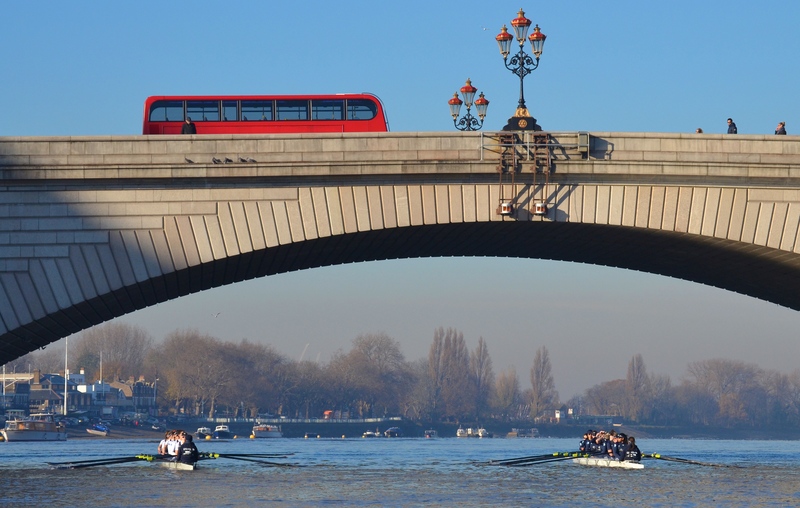 The 72nd Women’s Boat Race will be umpired by Sarah Winckless, who will become the first female to umpire a Boat Race on the Tideway, nine months after she became the first female to umpire a race at Henley Royal Regatta. 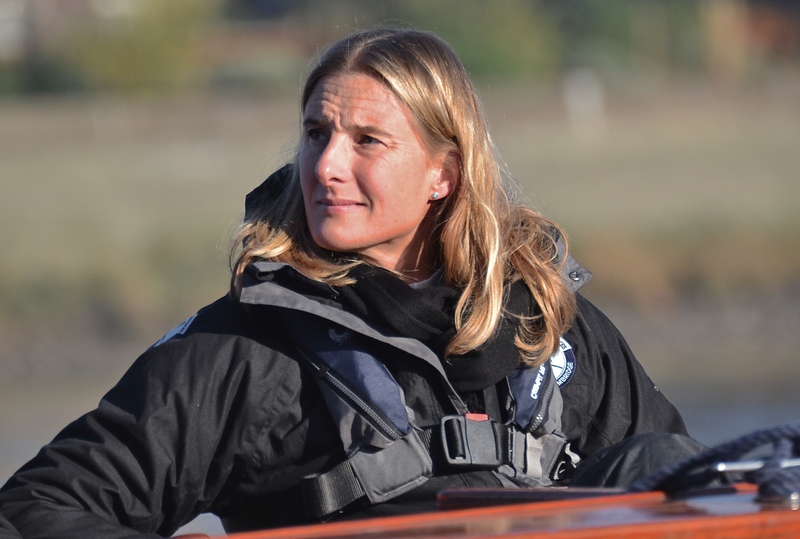 She rowed for Cambridge in 1995, 1996 and 1997. 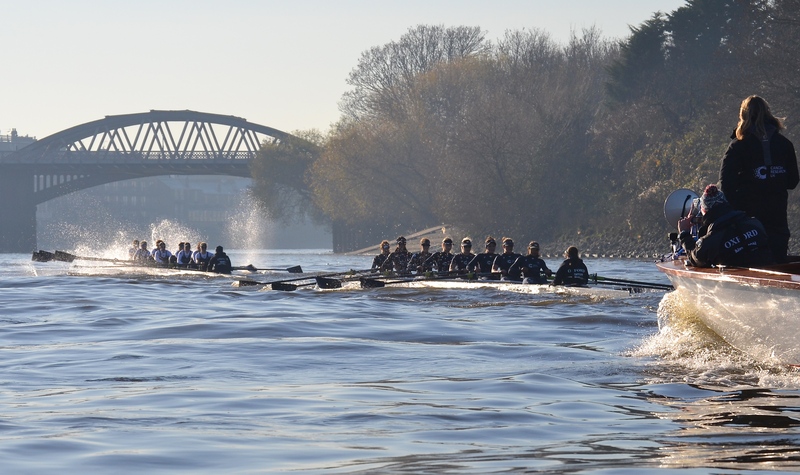 On a day when winter finally announced its arrival with plummeting temperatures and icy gusts, both Oxford men’s and women’s squads were in action in the annual Trial Eights race. 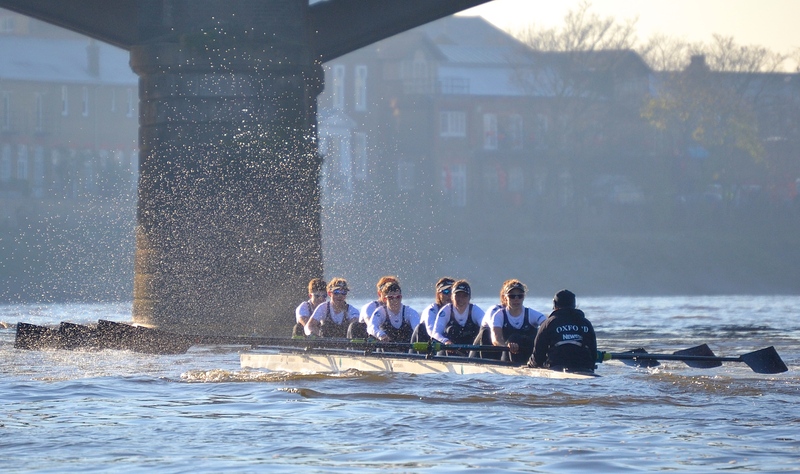 The women’s crews were first to brave the cold weather, on a course blessed with otherwise perfect conditions. The local wildlife was unimpressed, having seen it all before. Waiting to be called to the start, the trial boat “Helen”, stroked by Jenna Hebert and coxed by Eleanor Shearer. The full crew lists are on the official website as are the OUWBC biographies. The trial boat “Heather”, stroked by Flo Pickles and coxed by Clarissa Coveney. (The boats were) named Helen and Heather after Great Britain’s double Olympic gold winning pair, it was the latter who won the toss and choose the Surrey station. 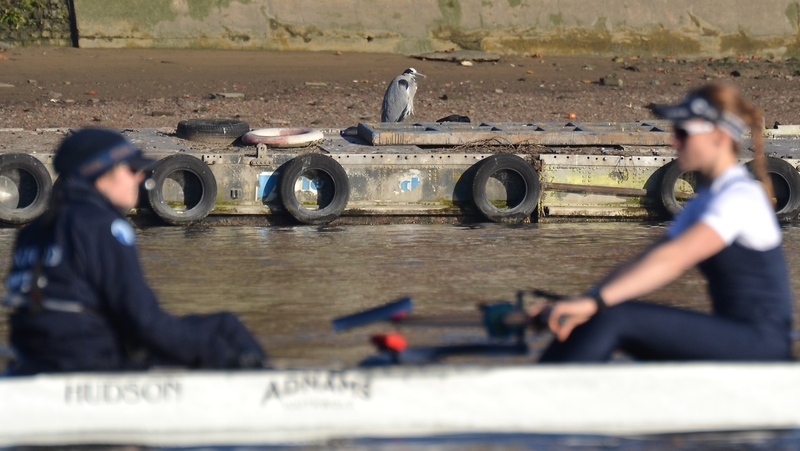 Under the watchful eye of umpire Sarah Winckless, who will also umpire The Women’s Boat Race in April, both crews got away cleanly and crisply. Under Putney Road Bridge. On the left, “Heather” was on Surrey, and on the right, “Helen” was on Middlesex. It was Heather who did the very early running, taking a seat by the end of the Putney Embankment. 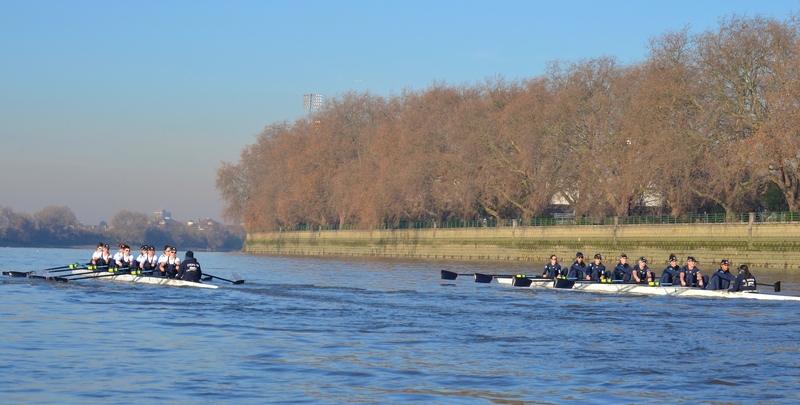 “Heather” (left) leads “Helen” along Putney Embankment. As mentioned in the report on the men’s race, the photographic parallax error makes the crew nearer the camera look further ahead than it actually was. Stretching around the Fulham Bend, Helen took the lead by no more than a couple of seats. “Helen” (right) took the lead passing the football ground. Both crews were rugged in their rhythms and locked horns again approaching the Mile Post, calling the umpire into action to separate them. In a dynamic and startlingly change of pace, Heather drew level, took the lead and stretched out to a length in the space of around 600m. Just past the Mile Post, “Heather” (left) is in the lead again. 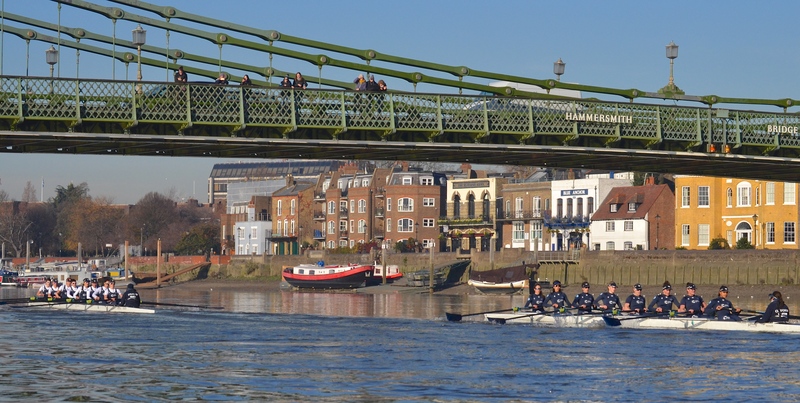 “Heather” has a comfortable lead at Hammersmith Bridge. 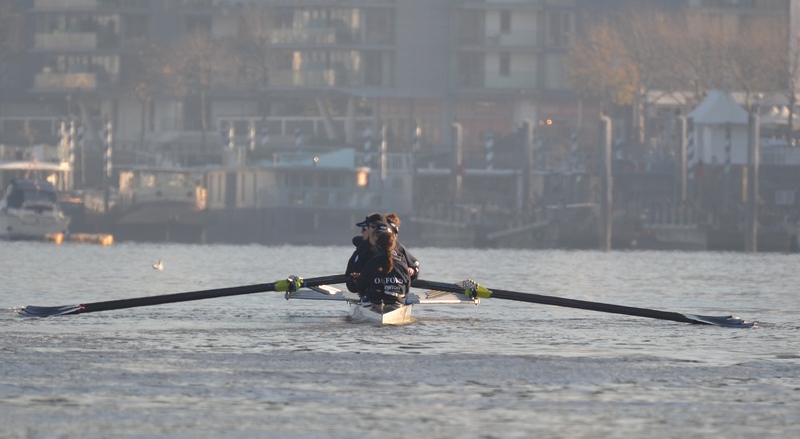 As the crews moved past St Paul’s boathouse, it was Heather who increased their lead to around two lengths and maintained this advantage all the way around the inside of the Surrey bend. The Dove Pier, Hammersmith, just past St Paul’s School. “Helen” at Hammersmith’s Black Lion Steps, over two lengths down but not giving up. At Chiswick Steps, just past the half-way point. Bumpy water ahead of Barnes Bridge made life difficult for both crews and Heather were repeatedly warned for steering across off their station. This looked to have ruffled the boat and Helen, coxed by Eleanor Shearer, began to close the deficit. Leading boat “Heather” did not cope as well as “Helen” with the wash at Barnes. “Helen” seemed to ‘enjoy’ the rough water around Barnes more than their rivals and this seemed to put new fight into them between Barnes Bridge and Chiswick Bridge. 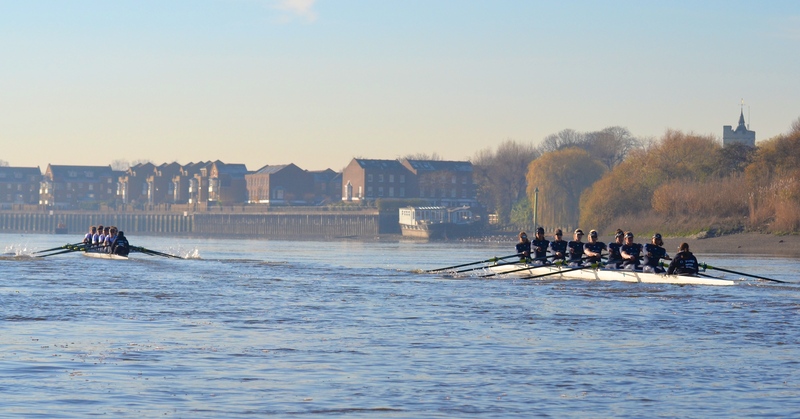 As Chiswick Bridge loomed into sight, Helen had regained contact with Heather and, as the crews raised their rate in anticipation of a sprint finish, it was Helen who looked to have the momentum. Crossing the line, both crews collapsed and the assembled launches looked toward the finish line for confirmation. In the end, it was confirmed that Helen had done enough in the final sprint to claim a narrow victory. At the finish post, the two crews were closer than this picture suggests. It was a great sprint finish by “Helen” as “Heather” seemed to run out of steam. 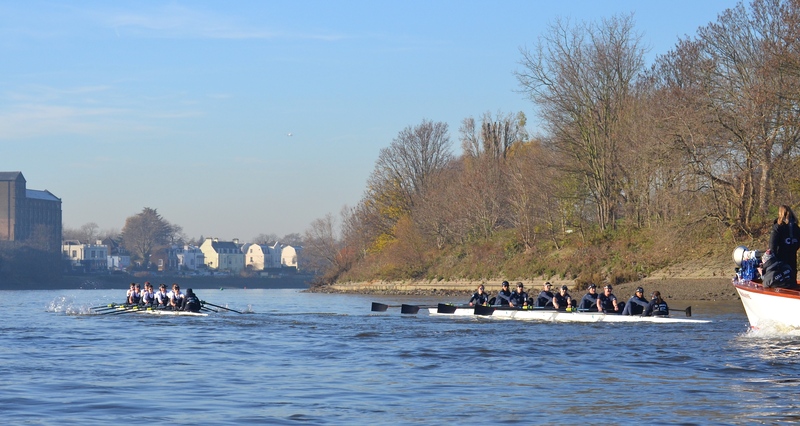 After 6.8k, the crews were separated by two feet or 0.7 of a second. 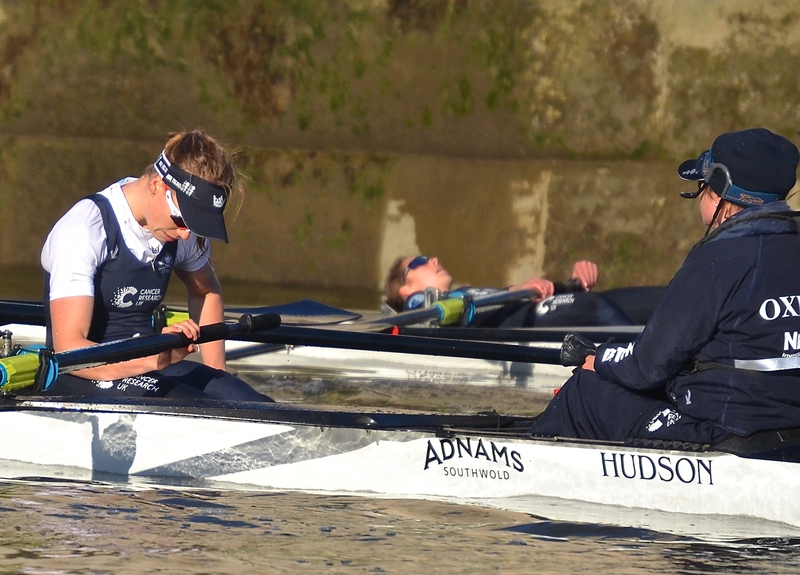 Recovering under Chiswick Bridge, “Heather” stroke, Flo Pickles, and her cox, Clarissa Coveney. In the background is “Helen”’s bow, Lise Du Buisson. In a race with no real losers, new coach Ali Williams will have a lot to think about. 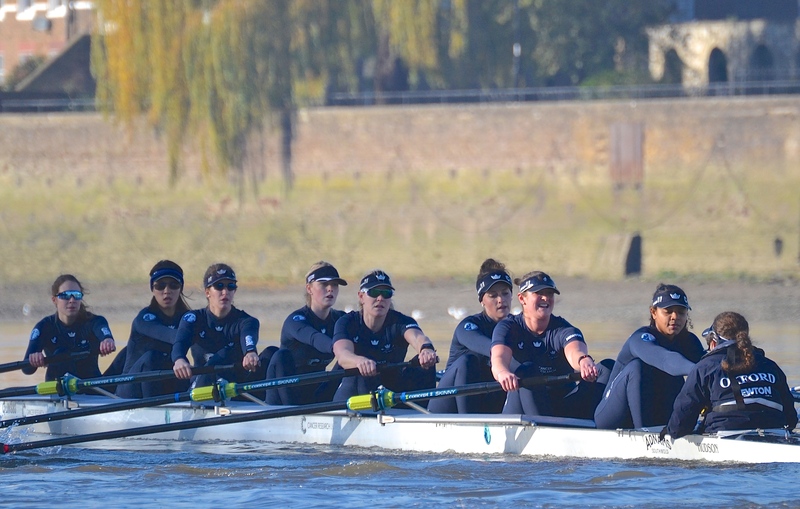 The 163rd Boat Race and the 72nd Women’s Boat Race will take place on Sunday, 2 April 2017. 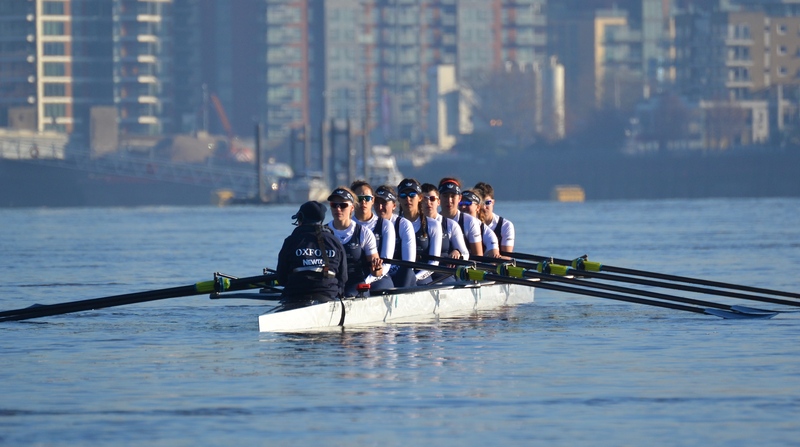 The Cancer Research UK Women’s Boat Race will start at 16:35, with The Cancer Research UK Boat Race an hour later at 17:35.